Just when those contestants were threatening to take over "American Idol" and make it all about themselves, Nicki Minaj went and brought the attention back to the judge's table on Wednesday's top 10 performance episode. And she did it without even being there. Minaj was late to the taping, a first in "Idol's" 12-season history. The show started without her — "we are coming to you live and on time from Hollywood," host Ryan Seacrest slyly noted at the top of the episode — and Ms. Minaj was nowhere to be seen. "I hear she's seven minutes out and there's some congestion on the 405," Seacrest explained, "so she should be here momentarily." Nicki eventually ditched the sunglasses but kept her hood up all night, and proceeded to make several bizarre comments to the contestants, using an extended metaphor to compare Kree Harrison to a plate of microwaved waffles, telling Angie Miller, "your legs are giving me everything I needed in life today" and commenting to Paul Jolley that his performance was "the first time you've stimulated my sexual appetite." At one point, Keith Urban leaned over to smell what was inside Nicki's Coke cup. Nicki's antics stole the spotlight from what was otherwise a winning night for Candice Glover and Amber Holcomb, the two best singers of the night. The theme was songs from other "Idol" winners, and Glover and Holcomb performed like champions in their own right, with Glover soaring on Shirley Bassey's "I (Who Have Nothing)," a hit for Jordin Sparks back in Season 6, while Holcomb tackled Kelly Clarkson's "A Moment Like This." "Hashtag: Pow!" Mariah Carey told Holcomb after her performance, while Nicki suggested "I (Who Have Nothing)" should never be performed live by any singers ever again after Glover "destroyed and annihilated" it. 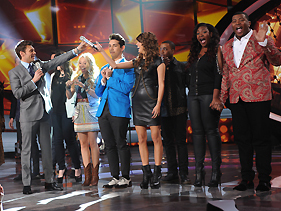 Holcomb was one of three contestants who took on Kelly Clarkson songs; of "Idol's" 11 winners, only six were represented. (Sorry Taylor Hicks, David Cook, Kris Allen, Lee DeWyze and Phillip Phillips.) Angie Miller also took on Kelly and won kudos for her version of Celine Dion's "I Surrender" (sang by Clarkson during her season), which Carey dubbed simply "stellar," while Lazaro Arbos stumbled with his version of Clarkson's "Breakaway," which was seen as timid by the judges. Randy Jackson criticized Arbos' pitch and said the song was "too big" for the Florida ice cream scooper. Devin Velez also struggled, taking on Carrie Underwood's "Temporary Home," which was called the wrong song choice by Keith Urban and dismissed as "too safe" by Jackson. While Velez and Arbos missed their marks, Paul Jolley and Burnell Taylor put on a good showing for the guys, with the former dropping much of the showiness of his past performances and the latter continuing to be the strongest male vocalist in the competition. One of the 10 performers will be sent home on Thursday's show, which is also set to feature performances by Bon Jovi and Phillip Phillips, as well as a sing-off between the male and female contestants closest to making the top 10 to see which of them will make this summer's "Idol" tour. And maybe we'll also get some better answers about why Nicki Minaj couldn't get to Wednesday's show on time.